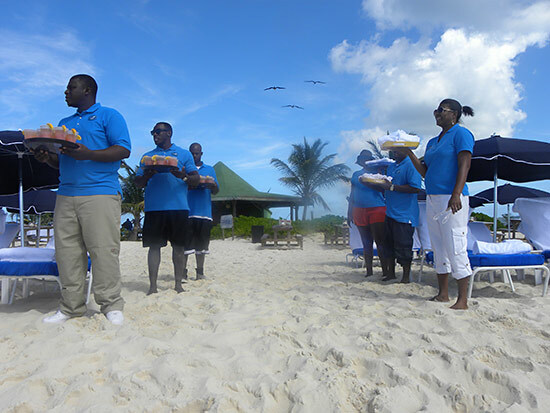 Blue Sea Anguilla has established itself as Anguilla's premiere destination management group. They are the people Louis Vuitton calls when organizing a photoshoot. And Mercedes Benz has them on speed dial, for all of their corporate incentive trips. Wedding planners organizing 100+ guest celebrations turn to Blue Sea to "make the impossible happen." For more intimate weddings and vow renewals, Blue Sea has that covered, too with affordable packages. • ... and that is just the beginning. Blue Sea kicks into high gear, going "above and beyond" to make "hyper-personalized" dreams come true (think: getting Alaskan crab meat on ice from Miami to Anguilla in 12 hours!). The only word that is not in Blue Sea's vocabulary? Impossible. Not an easy feat on a tiny Caribbean island, Blue Sea makes it all possible. Even in your own backyard, hiccups are almost inevitable when it comes to event planning. Somewhere between planning, coordinating and organizing in real time, setbacks occur. (That is not to mention, the bigger the event, the larger the hiccups!) Naturally, complications magnify when you add the distance and unfamiliarity of a destination location. 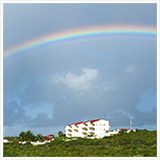 That is where Blue Sea Anguilla steps in, with on-the-ground, local expertise and man-power. 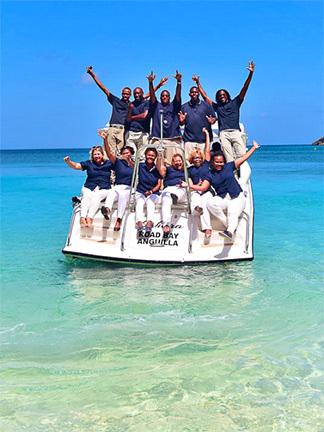 With decades of experience in Anguilla, Blue Sea is your proverbial right arm for Anguilla weddings, meetings, incentive groups and corporate events, production and vacation planning. See the video above for Blue Sea's Amelia Vanterpool-Kubisch's expert advice on what goes into planning some of the biggest events in Anguilla. 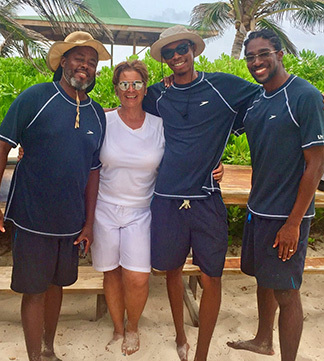 Keep reading for more on all of Blue Sea Anguilla's team and their five-star services. Brands with a critical eye for detail and immaculate execution, it is no surprise that Blue Sea is their "go to." The team at Blue Sea has the connections and the experience to accomplish what no one else can. They make it happen, and on time... not on "island time." Knowing how to "make things happen" in Anguilla is possible after years of experience in the tourism industry, working with the best on the island. Who is your "right arm" at Blue Sea? Meet Mimi and Amelia, two of the most accomplished women in Anguilla's tourism sector, and two of the hardest working women you will meet. Meet Mimi Gratton Originally from Quebec, Mimi holds a degree from one of Canada's most competitive programs, Concordia's Communications & Journalism program. She worked the communications industry for more than 25 years and has worked and lived in Anguilla for decades, with a firm understanding of the tourism industry. 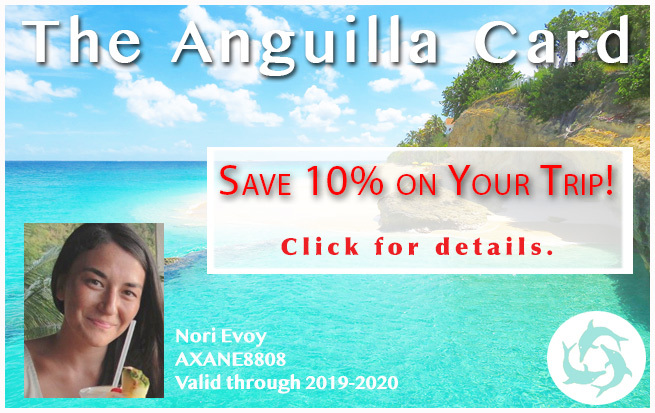 For 10 years she worked as the Executive Director of Anguilla's Hotel and Tourism Association, the key tourism organization on the island outside of the Anguilla Tourist Board. She won the Caribbean Hotel Association's Executive of the Year award twice. 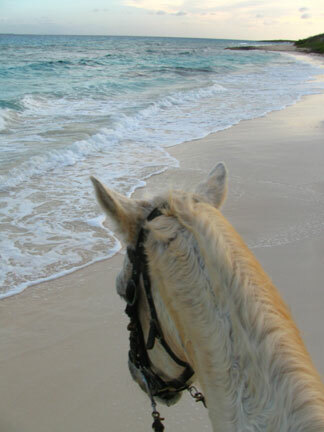 It's an understatement to say that Mimi knows WHO to call in Anguilla for ANY arrangement. She knows how to make things happen. 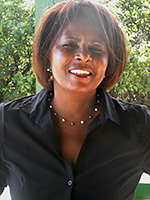 Mimi founded Blue Sea in 2007 with Fred and Marva Thompson and Sheldon Brookes. Together they brought Blue Sea to inception, creating a company offering a unique and superior service. 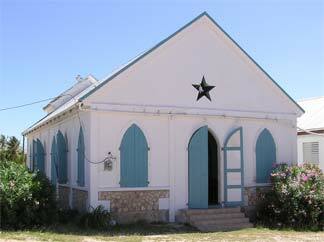 They worked tirelessly and passionately, and broke into Anguilla's tourism sector. In 2011, Amelia Vanterpool-Kubisch joined the team. The company climbed to new heights (more on Amelia below). Mimi lights fires - with her connections and under people to make things thought to be impossible, possible. From getting boats running in bad weather, to waiving fees thought impossible to waive, she keeps things moving and keeps things fun. A five minute chat with Mimi and you "get" her excitement and passion for what she does. She overflows with infectious energy! Meet Mrs. Amelia Vanterpool-Kubisch Award-winning Amelia Vanterpool Kubisch began her career in Tourism Management in 1978 as a clerical officer in the newly established Department of Tourism in Anguilla. Amelia, with all the hallmarks of her graceful personality, emerged as a cornerstone of the Department of Tourism and achieved the position of Director in 1992. She was responsible for Anguilla’s public sector marketing and promotion. During her tenure she worked closely with overseas representatives, providing her early on, with the experiences needed to understand and manage time and cultural challenges effectively. Amelia is responsible for many favorable marketing pieces used to promote Anguilla during its rise in the early 2000's, which is when I first met Amelia and immediately connected with her on a personal level. She retired as Director of Tourism in 2008, and continues her interests in the field of travel and tourism. After leaving her tourism role she served for 2 years as a Marketing Director at Malliouhana Resort and Hotel until joining the team at Blue Sea as a Destination Specialist. At Blue Sea she brings her years of experience in the tourism sector as well as her qualities of calmness, serenity, and dignity and applies them to her role at Blue Sea. Mimi will be the first one to tell you that Amelia is grace under pressure and is always ready with a smile. She remains cool, soft spoken, and reassuring in any circumstance and is an ideal personality serving those looking for a relaxing and vacation full of ease. Amelia "keeps cool" no matter what potential fire might be around the corner. She tackles it with her steadfast and respectful ways. Her client will never even know what lengths she may have gone to in order to present them with a neatly wrapped, finished product in the form of excellent and professional service. What do Amelia & Mimi and the entire Blue Sea team put into action? Anguilla weddings without a hitch, that is Blue Sea Anguilla's specialty. Their services cover the spectrum, from facilitating Anguilla's most lavish weddings to those that are more intimate and laidback. 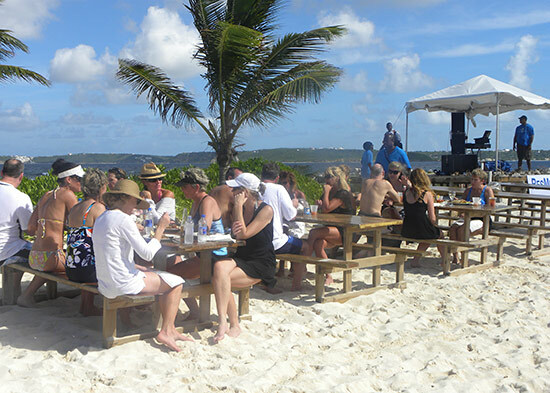 Blue Sea Anguilla plans, coordinates and organizes with dozens of vendors and locations all over Anguilla. The process is seamless, and even more affordable, with Mimi and Amelia knowing the ins and outs, and how to avoid costly fees. With a sophisticated local knowledge and expertise, they save you money, time and present options you didn't even know existed. Their years of expertise and experience come into play here, whether you are self-planning or you are the one doing the planning for the wedding party (a wedding planner or event coordinator). 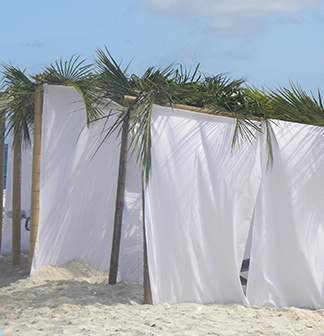 Self-planning an Anguilla wedding? We sat down with Amelia and Mimi to find out more on the details involved in pulling together picture-perfect Anguilla weddings. 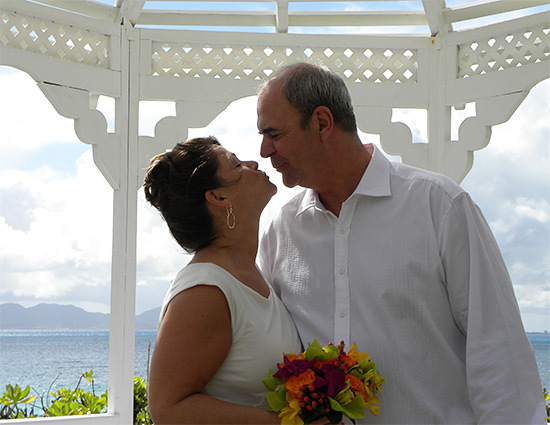 They share their insights, stories and information on their affordable Anguilla wedding packages here. If you're the one who's doing the planning (a wedding planner or event coordinator), your blood pressure will also go down the moment you talk with Mimi and Amelia. • ... and making sure you get on your plane home, boarding passes printed, all without a hitch. 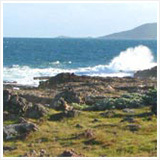 How do you get people to Scilly Cay? 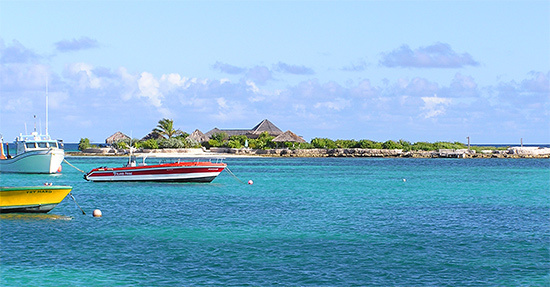 There is only one small boat that shuttles back and forth between Scilly Cay and the mainland wharf on Island Harbour. The boat's capacity is limited to a few per ride. Mimi says, "We needed to stagger the taxis to the pier. People need to step from the hotel to the taxi to the wharf to the boat, and not be waiting for the boat on the dock in the hot sun." Bingo. It's the grainiest of details that make the biggest difference. From the big-picture, to the "small stuff," Blue Sea thinks of it all and executes to perfection. 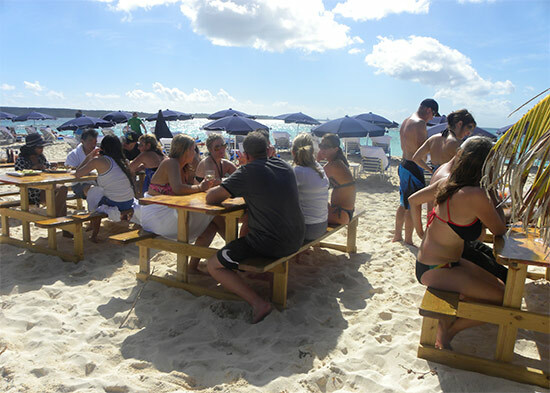 Anguilla has been growing as a destination for corporate meetings and incentive groups. Blue Sea Anguilla has long been at the center of it all. They boast a reputation for not just "pulling it all off," but creating the most talked-about events. It all begins before you even arrive. 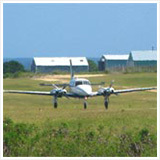 They are on the ground in Anguilla to receive, pull-together, and sort out details prior to you even stepping foot on Anguilla. When you do arrive? 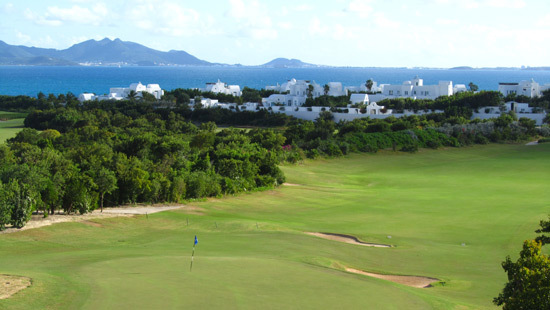 Blue Sea Anguilla doesn't just "meet you at the Anguilla airport or ferry terminal." If requested, they will meet you at your regional hub, ensuring every piece of luggage goes through customs as you walk ahead. Blue Sea smooths every detail from there, from transportation to event planning. 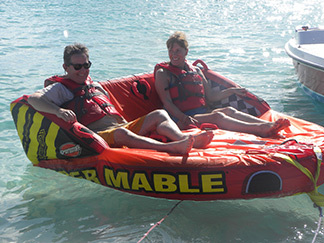 Blue Sea is RESMED's resource and feet-on-the-ground when planning their corporate getaways. 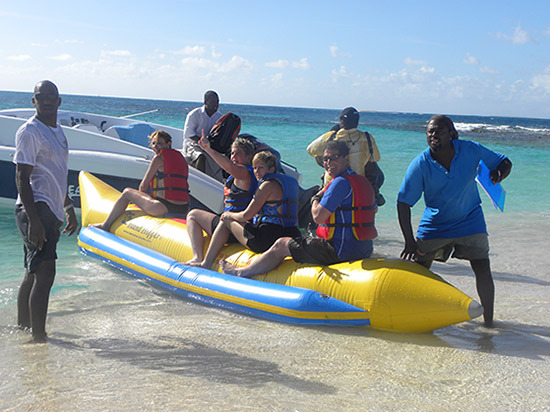 On one retreat, the group requested an afternoon of fun on idyllic Sandy Island. Sandy Island is a little piece of paradise, just a spit of sand with a small restaurant serving BBQ ribs, chicken, crayfish and lobster, a 5 minute boat ride from Sandy Ground. With 80 people in the group, Sandy Island's resources would be more than stretched. Not a problem for Mimi and Amelia and their staff. First? Getting to Sandy Island. 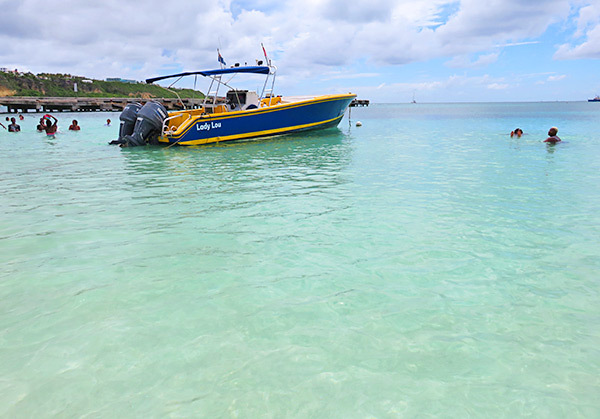 There is not a boat or catamaran in Anguilla that can carry 80 people to Sandy Island. 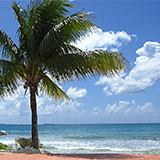 Mimi and Amelia turned to their resources in the neighboring island of St. Martin. 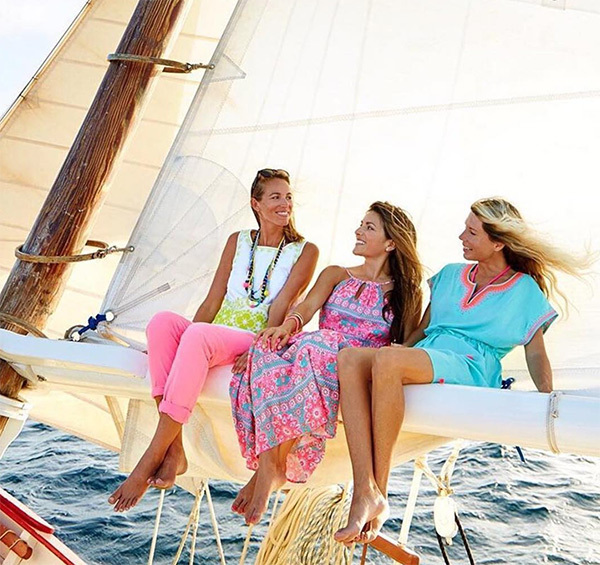 They coordinated a beautiful, spacious catamaran, comfortable for the entire group. Next? The resources on Sandy Island. Being a small island, with a tiny restaurant built for a couple of families on vacation and maybe the odd catamaran carrying 10 people from St. Martin, this spot would be overwhelmed by 80 people. "Bringing in our own staff and equipment was crucial," says Amelia. Who's Up For Tug of War? 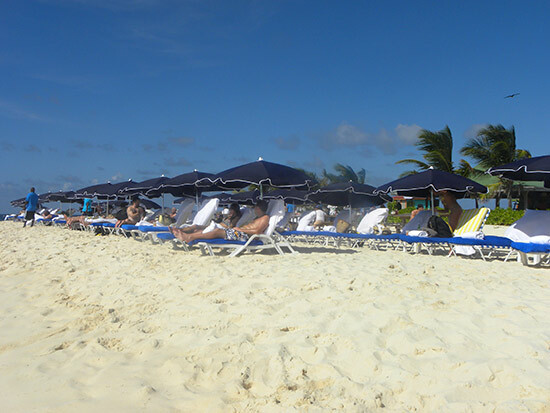 Normally a cay with a few beach chaises, they laid out 80 beach chairs and umbrellas. They brainstormed and organized a variety of activities to suit the interests of all who were attending. 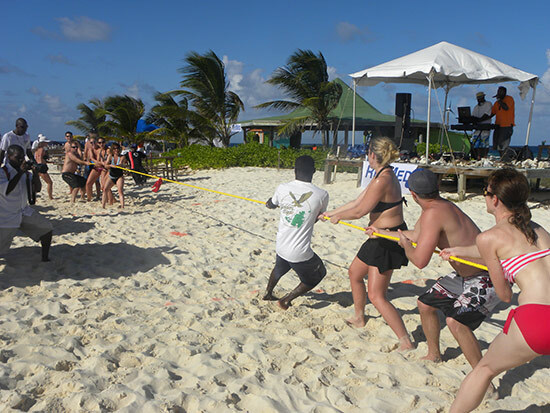 From group games like tug of war, to water activities like tubing, banana boat and snorkeling, they kept everyone entertained. What about those seeking a little R&R? The photo to the right is a tent that was custom-arranged for the group. Sandy Island was completely transformed. Another important aspect to the day? Keeping the guests fueled and hydrated! This wasn't Blue Sea's main focus, as they had bought out the island that day, and Sandy Island was supplying food and drinks. Blue Sea didn't just hand the food and drinks responsibility over to Sandy Island and leave it at that. They took it a step further. They set up additional picnic tables to accommodate the group of 80 and Amelia and Mimi rolled up their sleeves with their staff to serve guests, clean tables, and make sure everyone was being tended to. Amelia and Mimi worked with RESMED's coordinator and delivered a seamless event that was the talk of the company. Blue Sea meets you, greets you, organizes activities and makes calls no one else can make. What does that all boil down to? Peace of mind.... peace of mind beyond that things will all run smoothly, peace of mind that your event will be extraordinary, one people will be talking about for years. 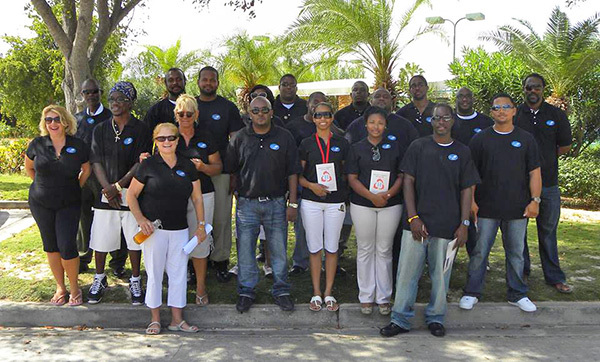 Blue Sea has established a proven track record with corporate groups. Their excellent reputation has expanded to facilitating high profile companies with expensive media shoots. From magazine spreads to television shows, it is no surprise that "the best in the business" choose Blue Sea Anguilla. 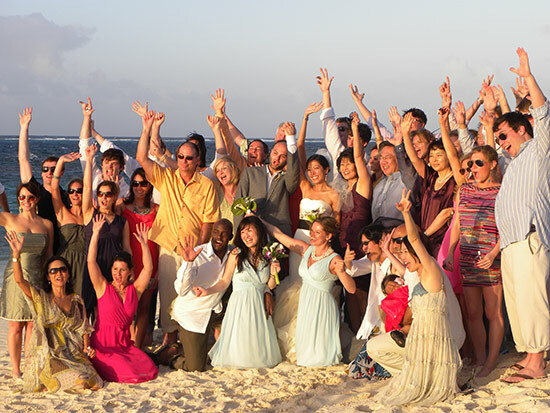 Similar to Anguilla wedding and incentive group coordination, Blue Sea takes care of all of the details. The result? Production is 100% focused on doing what they do best. 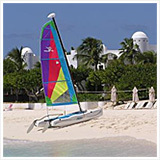 Blue Sea Anguilla brings the professionalism and reliability. They are the group to trust. 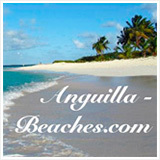 Last but not least, Blue Sea Anguilla is a one stop shop for vacation planning. Whether large or small vacation groups, Blue Sea plans activities, adventures, dinners, transportation and everything in between. They remove the hassle of finding available services (ex. 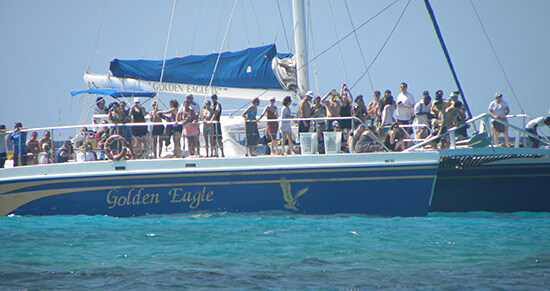 boat operators), scheduling the service and organizing any transportation. They know who to call, who has taken their boat out of the water (even for just a day), who is booked up, and every other last detail. They can also reach the "unreachables." There are certain tour operators that stop answering their phones when they have enough reservations. They always answer Mimi and Amelia's calls. 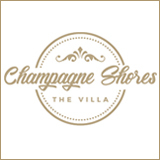 In a way, they are the ultimate concierge service. 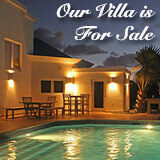 Yes, Blue Sea Anguilla offers it all with utmost professionalism, and passion. Mimi and Amelia are driven by happy, glowing faces, by memories that people take with them forever. With that in their heart, they ensure nothing goes awry. And even if something does? There's a back up plan. And a back up plan to the back up plan. And a back up plan to the back up plan to the back up plan. 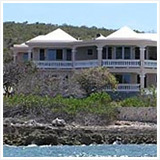 We have worked with Mimi, Amelia and the team at Blue Sea Anguilla for a long time! As Straw Hat has grown over the years, so has the demand for private events, weddings, corporate functions and dine around groups. 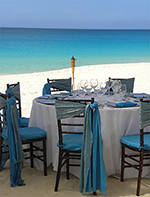 Blue Sea Anguilla is the best on the island when it comes to making arrangements with our team. They take care of planning every detail of an event - from transportation, to timing, to arranging bands and DJs and coordinating with all other outside vendors, so we can focus on what we do best. We truly appreciate their emphasis on communication! No detail is unimportant, and this has created a great working relationship between us and them. We want as much information as we can get in order to give the guests our best, and the team at BSA gets it. We love working with them and recommend them to anyone looking to have an event of any type at Straw Hat. 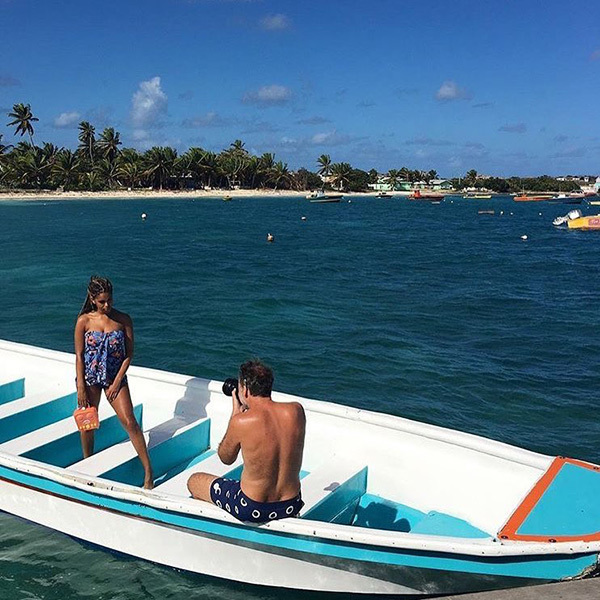 Mimi and the Blue Sea Anguilla team continue to make magic happen on Sandy Island. Every event is different and each one is hugely successful thanks to the attention they pay to the tiniest of details. It is always a pleasure partnering with Blue Sea on events. 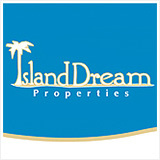 We were impressed by your professionalism, knowledge, and friendliness. Setting up appointments with Black Orchid, Chef Dale, the photographers, and the various hotels within a day of our initial meeting showed us that you meant business, and made us feel confident that we could pull the wedding off, despite living far away and having busy lifestyles. You kept us on track during the intervening months between December and our wedding in May; and, as soon as we arrived to the island a few days before the wedding, you greeted us and continued to keep track of last minute details. Everything, from large to small things, you handled with ease. When we needed coolers, pre-paid phones, transportation arrangements, and adjustments to the festivities - you handled. Mimi, once again, I don't have the words strong enough to express my gratitude for everything you have done to pull off the past 4 days. Thanks for having my back! Take care, til next time! Thank you so much for all your work on Radian's program & making it a huge success! You have an amazing team and I can't thank you enough! Thank you so much for your support of our inaugural President's Circle. The event surpassed all of our expectations and we could not have had this level of success without a partner such as yourself. Your team did a fantastic job arranging all of the logistics in a seamless manner! Thank you again for everything! You truly are the queen of Anguilla. It is apparent that you love what you do and put your heart into each and every aspect of the program.